What does your dog or cat get up to when you’re at work? Bridging the gap between a webcam and interactive toy, Petcube lets you spy on, talk to, and play with your companion animals while you’re away from home. The camera connects to your home network and allows access from an iPhone or Android app. It comes equipped with a controllable laser pointer, a speaker and microphone, and an emphasis on community and social features. You can even share your camera with family, friends, or the whole world if you really want to. So is Petcube worth the $149 price tag? Read on to find out. 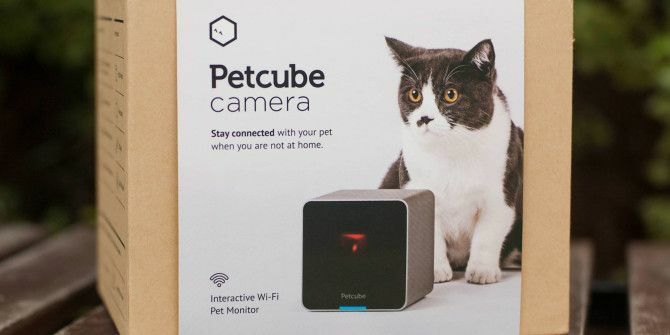 The aptly-named Petcube is just that — a metallic rounded cube that houses a camera, laser pointer and moving mirror, speaker and microphone, and a notification LED. It’s pretty big at 4 inches (10 centimeters) in all directions, and I’m not entirely sure why that is because it’s pretty light at only 1.3 pounds (nearly 600 grams). It doesn’t use a battery as it runs on USB power, and the unit itself just feels a bit hollow and empty inside. 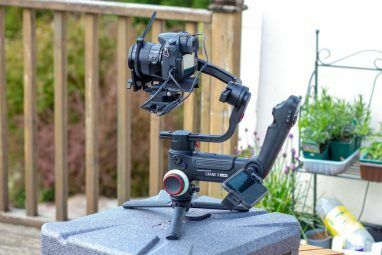 On the bottom of the Petcube you’ll find a rubberized grip and tripod mount The Camera Tripod Buying Guide For Beginners The Camera Tripod Buying Guide For Beginners Tired of camera shake ruining your photos? Want to take time-lapse shots or long exposure photos? Tripods allow for all of these, so if you don't have one, why not? Read More , the latter of which didn’t allow any of the two tripod mounts I have to screw in far enough (so the camera just flopped around). Fortunately I MacGyver’d a solution with some folded paper which closed the gap and allowed me to place the camera in an inch-perfect position using a Gorillapod What's the Best Phone Tripod? What's the Best Phone Tripod? For most people, smartphone cameras have become good enough to replace proper cameras. From shooting videos to taking that perfect landscape photo, your handset does a terrific job. Read More . The Petcube isn’t designed for any particular companion animal. While cats will probably get more out of the laser pointer, dogs are more likely to respond to the in-built speaker; and I’ve seen fish, rabbits, hamsters, and even a pig shared using the in-app social features. As its prime purpose is to “check in” on your hairy, furry or scaled housemates while you’re not at home, it doesn’t really matter who’s on the other side of the lens. A single button on the back of the unit allows you to connect it to your smartphone when you first plug it in, alongside a single USB port which uses a standard 5v microUSB connection. The LED on the front indicates the current status of your Petcube, with white meaning idle, blue to represent when it’s in use by someone, and a rapidly blinking red light to signify a lost connection. Setting up a Petcube is really easy. After you’ve downloaded the app and signed up for an account, you hit the button on the back, and connect to the unit’s Wi-Fi network which pairs the Petcube with your account. You can then point the camera at your home network and it’s good to go. Many IP camera setups are more complex How to Build a Security Camera Network Out Of Old Smartphones How to Build a Security Camera Network Out Of Old Smartphones There's no better use of old smartphones than by building your own DIY network security camera system -- we show you everything you need to know! Read More than this, and I can’t see how Petcube could have made this any easier (there aren’t even any serial numbers to enter). Once connected, the camera works exclusively through the Petcube app for post Android 4.0 and iOS 8.0 devices. There are no web or desktops apps, no HomeKit compatibility for Apple users Future Proofing Your Smart Home for Apple HomeKit Compatibility Future Proofing Your Smart Home for Apple HomeKit Compatibility Read More , and no Petcube API available for other apps or services. Launching the Petcube app on your device shows its current status, and tapping the camera (or one of them, as you can have multiple cameras tied to your account) will load a video feed of whatever your Petcube is looking at. You can then record the feed and take photos (which are stored on your smartphone), play with the laser pointer by tapping on-screen, and enable the microphone and speaker. The laser pointer works pretty well, though it will need to be calibrated for best results. Even so, don’t be surprised if the pointer doesn’t go quite where you tap on screen — dragging your finger slowly rather than tapping in different locations tends to work best. My cats love it, though it takes a bit of practice to gauge sensitivity. Sound quality is poor but passable, and I noticed some feedback on my iPhone which was a little distracting. It’s considerably worse in loud environments, or if you’re talking very close to the speaker, so best use it in quiet environments. The camera itself is a bit of a mixed bag. As the lens is fixed, it’s not possible to move the camera image itself — instead you have to make do with a 138º wide-angle shot. The lens points down at an angle which suggests that you should put your Petcube on a high bookshelf, but as I don’t have much vertical storage I had to angle the unit so that it was pointing slightly upwards using a tripod. It would be nice to adjust the camera position yourself, if not necessarily through the app then manually on the unit. Video quality is good enough, but it could be better. The camera only has a 720p sensor, but your Internet connection will dictate whether or not you get a smooth unbroken HD image, or a blurry compressed low-resolution mess. Assuming the video feed has to go to the Petcube servers first before being delivered to your smartphone, performance can be disappointing even if you’re only a few hundred meters away from your house. This seems to be the Petcube’s achilles heel based on my testing in Australia, but you may have better results in Europe or the US (Petcube is a Ukrainian company). Personally I experienced stop-start performance, and my connection is a relatively stable cable connection that doesn’t struggle to hold FaceTime or video conferences with colleagues. Therefore, I can only assume server distance is slowing things down. Low light performance isn’t great, but that’s to be expected from a small sensor. It’s also a good reason to take your smart home habit to the next stage and get yourself a proper set of connected lights 4 Ways Philips Hue Can Push Your Lighting to the Next Level 4 Ways Philips Hue Can Push Your Lighting to the Next Level Without Philips Hue, however, the smart home concept might never have gotten off the ground. Here are some cool ways to make use of them. Read More . The hardest part of the Petcube setup is deciding where to put it, especially if you have a dog or cat that tends to move around a lot. Not being able to adjust where the camera is pointing is limiting, and you’ll need to fine-tune the position if you want an overview of the whole room and not just the floor in front of your desk. It’s also worth keeping in mind that you then have a camera running at all times in your home, which you and other pre-approved users can connect to. Some people in your household might find that a little creepy. The LED does at least show the camera’s status, and you can enable a notification noise which sounds when a user connects to it. One unintended use for Petcube might be as a fallback security device, but it shouldn’t be relied upon for this purpose. You can record video remotely, snap pictures, which could be useful (or you could just scare the people you live with). Petcube isn’t just a device, but a social experience too. You don’t need a Petcube camera in order to download the iOS app, and you can sign up purely to engage with other users, share pictures, and control other Petcube devices which have been made available publicly. You’ll also need this app (and an account) if you have friends or family members who want to share their camera with you. Sharing is an important part of the Petcube experience, and the company has covered the functionality well. You can add family members, who can access the camera as if it were their own at all times, and even change the settings associated with it. You can also add users as friends in-app, then enable sharing with these friends between certain times of day. And then there’s public sharing, which allows anyone who uses Petcube to connect to your camera and see what your dog or cat is up to. Both friend and public sharing can be limited by time and day, and you can opt to disable the laser pointer, speaker and microphone, or both. You’ll also receive a notification whenever family, friends or public users connect to your camera. At any given time there are 20-50 (and sometimes more) Petcube cameras publicly available, with some of my favorites being in animal shelters 5 Best Animal Rescue Sites To Find Your Next Pet 5 Best Animal Rescue Sites To Find Your Next Pet If you’re thinking of adding a new pet to your household, you may want to look into adopting or rescuing one from a shelter instead of buying one from the nearest pet store. Local animal... Read More . For everyone else the public functionality raises privacy concerns, but it’s a nice optional extra. You can also choose to have push notifications delivered to your device when your Petcube detects “significant” motion or sound. Finally, the app can be used like Instagram to share images with your friends, and explore public images posted to the application. Why you’d use this over Instagram remains a bit of a mystery, cross-posting seems to be the way to go if you want your dog or cat to have their five minutes of fame. Should You Buy a Petcube? Petcube as a product should be viewed holistically, because as a camera you can connect to through your smartphone it’s a little barebones. When paired with the laser pointer and interactive audio features, the package starts to look a little sweeter. Everything is then tied together with a foolproof setup, ready to go mobile app, and a fairly active social network you can get involved in. It’s nice to be able to connect and check on your dog or cat, and it gives you a window into their lives when you’re not around. It’s easy to use and setup, but it’s let down by a lack of consistency in the video department. I’d love the ability to move the camera, preferably remotely, and I wish it wasn’t pointing downwards at such a severe angle. A better quality sensor for improved low light performance would be nice, and some sort of rudimentary “night mode” wouldn’t go amiss either. But these are largely subjective complaints. The Petcube strikes me as a great “gift” product in that it would appeal to the animal-obsessed people in your life Become a Smarter Pet Owner With These Gadgets Become a Smarter Pet Owner With These Gadgets Have you heard of an intelligent fish aquarium or a robot-like companion for your dog? These are examples of smart products you can buy and use in your pet-friendly home. Read More . Whether or not it offers enough to have them part with $150 is another question however, and for me that price is a little steep. You’re definitely paying a good deal of markup over a simple IP camera solution to have additional toys and an all-in-one smartphone-friendly package. Update: Petcube has notified us that they’ve permanently reduced the price of the unit to $149, from the previously stated $199. Explore more about: MakeUseOf Giveaway, Pets, Remote Control, Toys. So wheres the entry box? If you have an old cellphone around, just use Alfred. No laser pointer, but otherwise the same functionality for the most part, and free. Been using it for quite a while and it's perfect for my needs. You can turn on the light if it's too dark and the night vision mode is decent. Great idea, also works well with an old tablet/iPad, or even a dedicated webcam unit connected to a computer. With PetCube you're essentially paying for the convenience of a ready-made product, mobile app, and some interesting social features. What about it do you find wrong, out of interest Kay? Is it the laser pointer? Petcube certainly isn't a replacement for spending time with your companion animals, playing with them, walking them, and shouldn't be seen as such. It's essentially a glorified webcam in a mobile wrapper that has a few extra features you can choose to use if you really want to. I don't think it's an inherently bad product, though I admit the laser pointer raised concerns initially. first of all, I have no clue about animals other than owning two cats, so I might be convinced, but other than that, yes - Petcube shouldn't be a replacement for spending time with your animals. But I also know how our cats react when I listed to an audio message of my wife. They get totally excited and come running right away and are totally confused that she isn't around. I can't imagine what the Petcube would do in this case. And aren't there already enough video's flying around with someone having their cats turning exhausting circles trying to follow a laser pointer? Maybe instead of buying this toy, people should rather buy a book about what their pets really like? Just like with humans, it's probably spending time with them.